Samsung Galaxy 551: Press the letter T + Power button. To navigate up and down can use the arrow keys, while the option to use the Shift key. Samsung Galaxy Y (Young) GSM: Press the HOME button + Vol Up + Power button simultaneously for a few seconds. 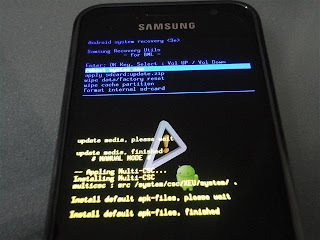 Samsung Galaxy Y (Young) CDMA: Turn the HP> Press the Power button when the Samsung logo appears> press the VOL UP button to go into recovery mode. If the phone starts normally go into the menu as normal, turn off the phone again and repeat the process from the beginning. Samsung Galaxy W (Wonder): Turn off the phone, press the Volume Up key + HOME button (the middle button) + Power button simultaneously> wait until it comes out the logo "Samsung", then immediately release the button the third button, starting from the first power switch . When the logo appears Android / picture box and arrow> press the MENU button (the button to the left of HOME button). If not managed to get into recovery mode, repeat step 1. Samsung Galaxy Ace Plus: Press Vol UP + Vol Down + HOME buttons simultaneously while the third and TSB button is pressed, press the POWER button and then immediately released (do not hold). Wait until it snaps off all the new recovery menu button. Mount system, sdcard, data, etc. Similarly, the tips and tricks that I can say may be useful for you all. 0 Response to "How to Solve HP Android Forgot Password or Pattern Lock"